Through this Online Spanish grammar for teachers training course , students will perfect their knowledge of Spanish grammar, with the main objective to project it in his work as a teacher of Spanish as a second language. Tools to understand and work the main grammatical aspects of the reference levels (A1, A2, B1, B2, C1 and C2) of spanish language will be provided. The Online Spanish Grammar Teachers Training Course is divided into two parts distributing reference levels into two blocks. In the first part you will work the first three levels and in the second one, the remaining. The Course is aimed to teachers or future teachers, native or not*, with or without experience in teaching Spanish. *For non natives, a minimum and accredited level of knowledge of Spanish language is required (For the First Part: DELE B2 and for the Second Part: DELE C2). Candidates who doesn’t have an accredited level, can justify it trough our level test. It includes 8 sessions of individual tutorials, electronically. Structure: Complete Course: 80 hours; Part 1: 40 hours; Part 2: 40 hours. Duration: 7-8 weeks, depends on learning (option to extend, to agree). Tutorials: Maximum 8 (Full Course). Maximum 4 (1st part). Start: Any day of the year (Monday to Friday) excluding holidays, after confirming tutor availability. between the teacher and student. – You will know which are the proper grammar contents of each level. – You will design explanations for some of the most confusing aspects for students. – You will be able to explain grammatical content in different ways. 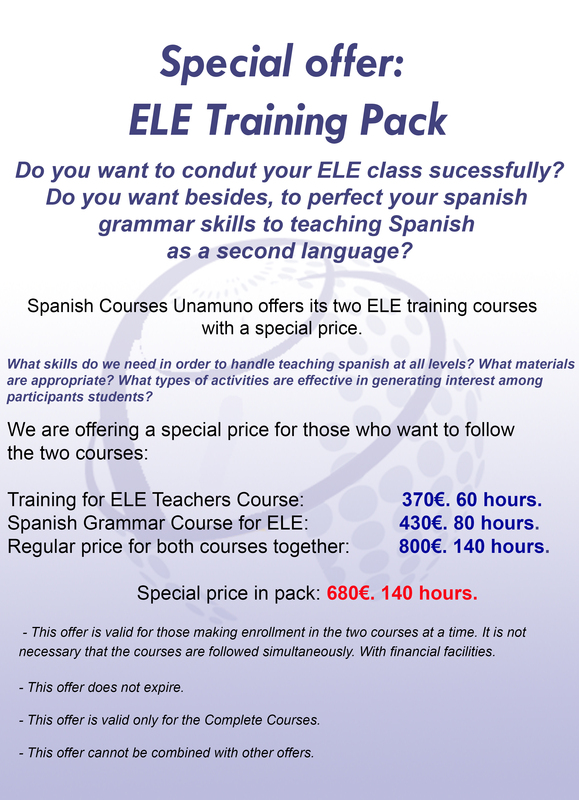 – You will awaken interest in the study of Spanish grammar. Part 1: Levels A1, A2 and B1. Part 2: Levels B2, C1 and C2.